we went out on the town today. to all of my favorite little charming boutiques in salt lake city. the ones i love (and missed when living in idaho). they each have kiddie corners for small ones to play without fear of breaking anything. genius! whenever i have a good excuse to go to one of my shops, i usually stop and stare and swoon awhile and maybe pick up one or two things. i rarely buy, but it's always fun to browse. today i found a few perfect goodies for the girls in my life (and made a wish list for myself too). the shopping trip inspired my swoons of the season. 01 / apparently orla kiely has clothing too. i had no idea. (i may have been better off not knowing.) i saw her dresses all lined up at children's hour and almost fell down when i saw the price tag. still, they are modest and adorable and vintagey and comfy too. not that i tried them on, i'm not that crazy. someone out there, please splurge on a fancy frock for the rest of us. 02 / miz mooz bloom boots. these, i did try on. they are even prettier in person. (for you locals, i found them at hip & humble.) slouchy yet chic. flat yet fancy. a perfect rounded toe. swooning all the way home. i may have a new reason to save my pennies. 03 / jane austen 500 piece puzzle. i don't even like doing puzzles and this one caught my eye. 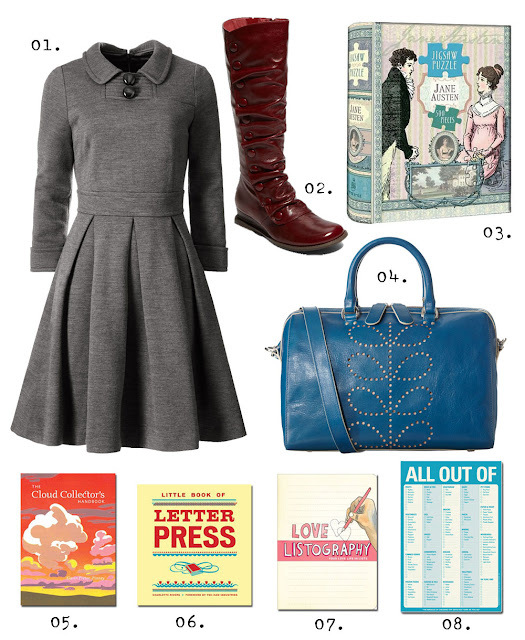 so perfect for the literary lady in your life. 04 / this orla kiely purse is downright dreamy. and crazy expensive. 06 / little book of letterpress. this little hardback beauty caught my eye at barnes & noble. i know so many shelves that this book would be just right for. love that letterpress is so trendy right now. it so deserves it. 07 / have you seen these listography journals? they are so clever. perfect for yourself or a favorite list-lover. 08 / i love knock knock note pads. anyone could use this simple grocery list for their fridge. 09 / darling baby shoes. i did not take full advantage of overpriced and overtly darling baby shoes when benji was tiny. next time around i may splurge once or twice. saving them in a shadow box will give you a piece of art when they grow out of them. 10 / rosie flo's sticky coloring book totally would have been something my big sister might get for christmas and i'd be green with envy. i'd wait a week or two and maybe snag a page. because i was a total typical little sister. confession, sometimes i'd read their diaries too. but to my defense, how awesome would it be to have such a fan dying to read your middle school diary?! i guess this is why we youngests love to blog. 11 / maileg's noah's cruise ship might be the sweetest noah's toy i've seen thus far. and likely the most expensive. still, the charming pieces are magnetic and painted so simplistic and bright. sure to be a keepsake. 12 / stripey sweaters on tiny tots make me smile. 13 / i started letter writing when i was young and think stationery is a perfect go-to gift for any age. i can't wait til this girl scout mix & match set is available. 14 / shane the boogaloo boy is soft, a little smushy and adorable (just like my three year old). 15 / eloise wilkins stories. i had to include this favorite collection because we own it and love it. we take it to church and on long drives. i found it at tj maxx and scooped it up a few months ago. it includes the classic stories and images that were read to me when i was little. the stories are perfect for girls and boys alike. um, YES. a jane austen puzzle?! that is for me! and those boots... so major. love the whole list, mart! What, No stop to EmilyJane? It's my fave!! Are you on Chronicle's e-mail list? They do these crazy discount codes (to the tune of 35% off + free shipping) a few times a year. I just got my latest order in, for Christmas presents to friends. It's awesome! Ahhh! So sorry to miss you at Hip and Humble today! I was buying holiday presents for teachers. Freaking out over the Jane Austen puzzle!! We have the All Out Of list on our refrigerator! It is so handy and fun to use! Max, at age 2, adores that exact Eloise Wilkin book. And we have a very specific order in which we read the stories at bedtime - Busy Timmy, Baby Listens, Baby Looks, Baby Dear then (if I'm complying with his attempts to procrastinate bedtime even further) We Help Mommy. And I adore that Orla Kiely purse. 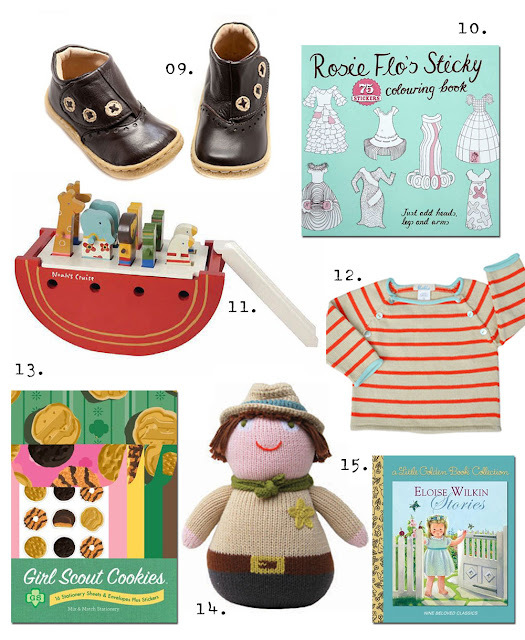 I adore your blog... it's one of my favorites, and this little gift guide/wishlist is awesome. THAT DRESS!! It's amazing. #14, yes! blabla makes the darn cutest stuff EVER.